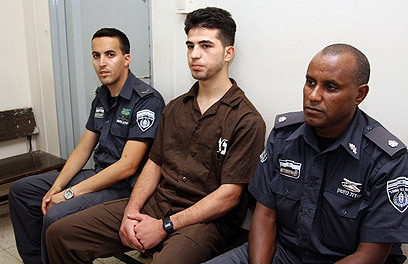 The Samaria District Military Court on Tuesday convicted Hakim Awad, 18, in the murder of five members of the Fogel family in Itamar five months ago. Awad was also convicted in a series weapons-related and security offences. The trial of second defendant Amjad Awad is still ongoing separately as the two are testifying against each other. Awad corrected the presiding judge several times as he read out the details of the indictment to which he confessed. The defendant noted that the Fogel children looked at him and Amjad through the house blinds, and not the other way around. Awad also said that his relatives were initially outraged to learn of the murders, and even beat him and Amjad before they helped them conceal the weapons. He noted that when their uncle refused to help the two, he threatened to go back to Itamar to commit another murder. Only then did the uncle agree to help conceal their weapons and blood-soaked clothes, Awad said. He did not show any emotion during the arraignment and confession. Despite the confession, the judges decided to examine some of the prosecution's evidence, primarily forensic evidence such as as finger prints and DNA, before announcing the conviction, in order to verify that the confession matches the findings. Presiding Judge Menachem Lieberman explained: "The reason behind the decision is that the event in question caused shock both in Israel and abroad and there is an element of suspicion – however ludicrous this may sound – that a person will claim responsibility for an act he did not commit for the sake of 'glory'." The judges eventually convicted Awad in five cases of murder after examining the evidence. The defendant's attorney Raed Erda said that after receiving the evidence and in light of his client's confession he had no choice but to plea a confession in court. The court will discuss sentencing arguments in September and will hear testimonies from the Fogel family. The prosecution has mentioned in the past that it will not seek the death penalty. See all talkbacks "Fogel family murderer convicted "